Bowcock & Pursaill have been involved in bringing the former Spode pottery site at the heart of Stoke-on-Trent back to life. The development of the factory off Elenora Street marks a new chapter in its history after pottery production ended there in 2008 and is now regarded as a brilliant example of heritage buildings being used for new purposes. Working alongside entrepreneur Jeff Nash, Bowcock & Pursaill property specialist Joy Hancock has been involved in the legal paperwork required to help Jeff create a popular café, 26-bedroom hotel (the Potbank) complete with bridal suite, and an events space on site which are already proving a hit with visitors and residents alike. 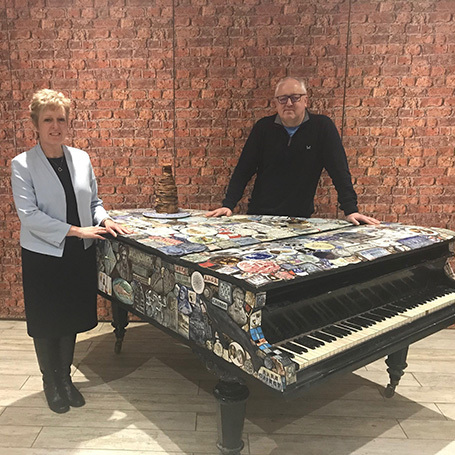 Joy said: “I’ve been working with Jeff for around five years now, helping him with his 999-year lease agreement from Stoke-on-Trent City Council for the site. “It has involved extensive negotiations between Jeff and the Council as we exchanged on this matter back in November 2016, and subsequently completed the 999-year lease just before Christmas 2018, following completion of major renovation works. “Jeff is extremely ambitious and is bringing interesting and new ideas and opportunities to The Potteries. Spode is just one of several sites he has already bought and developed in and around the area, but it’s certainly one of the most significant. “From a legal perspective the volume of work has been quite extensive. I have been involved in a lot of the paperwork including the purchase of the sites, drawing up any leases Jeff subsequently grants, together with funding arrangements as required in order to facilitate the development of the site. “Sections of the factory have been sub-let on long term leases to third parties, parts then leased back, involving a hierarchy of head, under and sub leases. Jeff said: “Joy has supported the legal paperwork across all of the sites I now have, but the Spode one was more involved as I acquired Spode from the council and developed the site with a financial partner under an agreement while waiting for planning permission for large parts of it. “My financial partner took ownership of the upper floors at Spode, which we lease back, and underneath that there have been loans from the banks and quite complex transactions, so I needed someone very experienced in all the financing options. “The Potbank hotel opened in June 2018 and it’s aimed at providing medium term accommodation. There are kitchen facilities in the rooms and it’s quirky, providing a home from home for itinerant people including contractors, students and employees, who are coming in and out of the area from elsewhere.